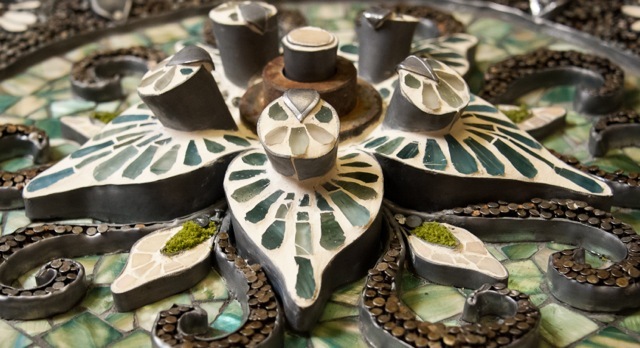 Stephanie is a ceramic mosaic sculptural artist based in Newport, South Wales. After graduating from UWIC at Howard Gardens, Cardiff with a BA (Hons) in Ceramics in 1994, Stephanie began her mosaic art training while working for Pioneers, a community mosaic organisation, between 1995 and 1997. She then went on to launch her solo career in 1999. With funding from arts grants, the EU and local authorities, this has allowed her the creative freedom to work on a variety of projects including residencies, public art and regeneration projects throughout South Wales and Southern England. These experiences have inspired her to formulate mosaic art projects for communities, schools and charities – providing art as a vehicle to address a spectrum of social issues, educational support and provide art as a form of therapy to individuals and community groups. Stephanie’s professional membership into the British Association for Modern Mosaic (BAMM) has won her the post of Regional Coordinator for Wales and her international exhibitions and bespoke mosaic art has lead her to being awarded a position in the highly acclaimed Urban Mosaic Art Project 2014 in Chile.